350W Top rated 1.5L plastic jar Rotary Switch Food Blenders with grinder YX-Y44C are one of our well received models. 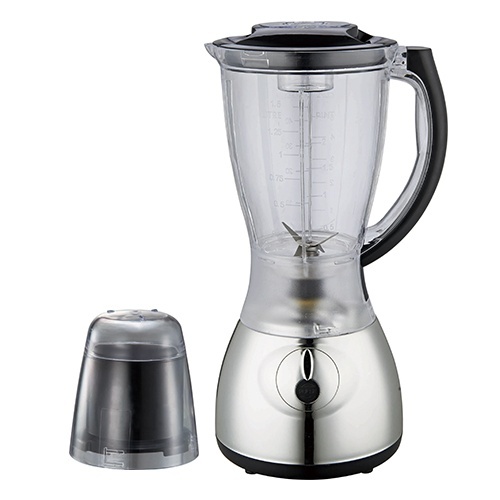 With 350W powerful motor and chrome body, they make this 1.5L Plastic Jar Food Blenders have very attractive apperance. Besides, 4 speeds with pulse function can ensure you adjust to the right consistency no matter what you're making. Once you own this Food Blenders, you'll love whipping up new creations and old favorites. So hope you can enjoy your healthy life with healthy food early. Just contact us to make it come ture. Besides, we also have Baby Food Blender and Smoothies Maker Blender. Looking for ideal Top Rated Small Food Blender Manufacturer & supplier ? We have a wide selection at great prices to help you get creative. All the Ice Smoothies Maker Food Blender are quality guaranteed. We are China Origin Factory of Smoothies Maker Food Blender. If you have any question, please feel free to contact us.